Hey you! Check these tips which I’ve learned through trial and error over years of hunting this astonishing game bird with the long, pointed tail. Different hunters prefer different guns to go bird hunting, and dove hunting is of course no exception. 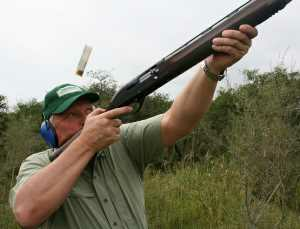 According to some, the best is to use a shotgun with small pellets, sizes 7.5 to 9. However, to improve your results, a choke should be used, especially depending on your marksman skills and of course, the distance to your target. A modified choke allows you to have a longer range, since the ammo pellets will stay together for a longer time and usually travel at a higher speed. This is mostly used when shooting from a distance of around 40 to 50 feet, with an impact area of around 18 inches in diameter. A normal choke is usually recommended for shooting from the ground up, when you are walking and shooting birds that fly off when you come close. The distance to the target is shorter and you have to be fast to fire more than one shot, so you want a larger impact area for your ammo, maybe around 2 feet in diameter at a distance of 20 or 30 feet. Dove hunting trips in Argentina are also a great opportunity to improve your marksman skills, as you can try different shooting techniques and chokes on your shotgun. Besides, results will also depend on the pellets you use, the ammo size, angle of your shot, wind resistance, etc. However, learning to use the best choke for your shooting style will improve your results significantly. According to you, what is the best choke for dove Hunting?